Easily grown in average, medium moisture, well-drained soils in full sun. Tolerant of a wide variety of soils including clay. Intolerant of wet soils. Tolerant of some drought once established. Also tolerant of many city air pollutants. Pruning may help maintain compact habit. Juniperus x pfitzeriana is a hybrid designation that includes certain cultivars that are crosses between Juniperus chinensis and Juniperus sabina. 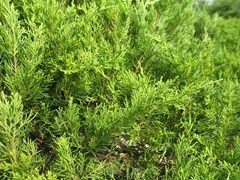 Such cultivars in the Pfitzer Group are sometimes commonly called pfitzer juniper. ‘Mint Julep’ is a compact, spreading, evergreen shrub that typically grows 4-5’ tall and 4-8’ wide over the first 10 years. As the cultivar name suggests, it is noted for its mint green foliage which retains good color throughout winter. Foliage is primarily scale like (adult) with some awl-shape (juvenile) needles. 'Mint Julep' is currently sold in commerce as a cultivar of Juniperus chinensis, Juniperus x media or Juniperus x pfitzeriana. Monrovia Nursery of Azusa, California introduced 'Mint Julep' into commerce in 1961. Monrovia currently sells a plant as Juniperus chinensis 'Monlep' under their trademark name of MINT JULIP. Notwithstanding the nomenclature differences, 'Mint Julep' is very similar in physical appearance to Juniperus x pfitzeriana 'Sea Green'. Rock gardens. Foundations. Low hedge. Spreading ground cover shrub.